A Finnish research group from the University of Turku, University of Tampere and Aalto University has mapped the organisation of human conscious feelings and found them to cluster into five major categories: positive emotions, negative emotions, cognitive functions, somatic states, and illnesses. Humans constantly experience an ever-changing stream of subjective feelings that is only interrupted during sleep and deep unconsciousness. 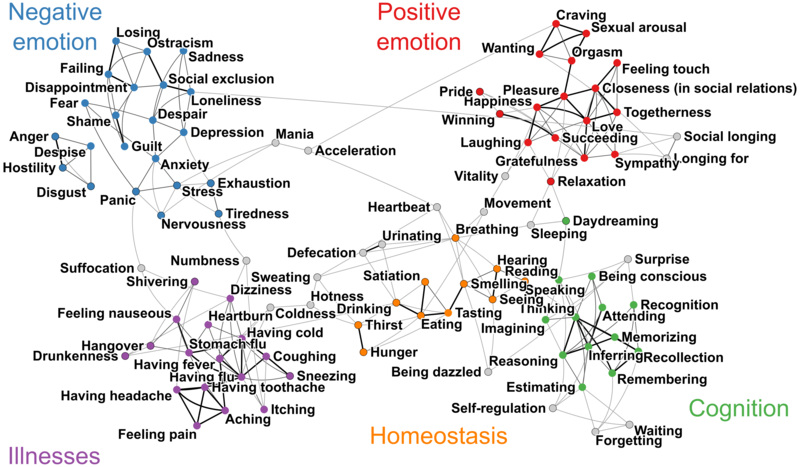 Finnish researchers show how the subjective feelings map into five major categories: positive emotions, negative emotions, cognitive functions, somatic states, and illnesses. All these feelings were imbued with strong bodily sensations. ‘These results show that conscious feelings stem from bodily feedback. Although consciousness emerges due to brain function and we experience our consciousness to be "housed" in the brain, bodily feedback contributes significantly to a wide variety of subjective feelings,’ explains Associate Professor Lauri Nummenmaa from Turku PET Centre. ‘Subjective well-being is an important determinant of our prosperity, and pain and negative emotions are intimately linked with multiple somatic and psychological illnesses. Our findings help to understand how illnesses and bodily states in general influence our subjective well-being. Importantly, they also demonstrate the strong embodiment of cognitive and emotional states,’ adds Nummenmaa. ‘Having the map of conscious mental and bodily states will help us better characterise participants in our brain imaging studies. They go through a variety of experiences watching naturalistic videos or simply resting in the scanner while we measure their brain activity. By quantifying an individual’s bodily and mental load we can better discern similarities and differences between people and interpret our imaging results more precisely,’ says Enrico Glerean, co-author and postdoctoral researcher at Aalto University. ‘We have obtained solid evidence that shows the body is involved in all types of cognitive and emotional functions. In other words, the human mind is strongly embodied,’ says Riitta Hari, co-author and Academician of Science at the Aalto University Department of Art. The results were published 29 August 2018 by the National Academy of Sciences in its journal Proceedings of The National Academy of Sciences of The United States of America (PNAS). 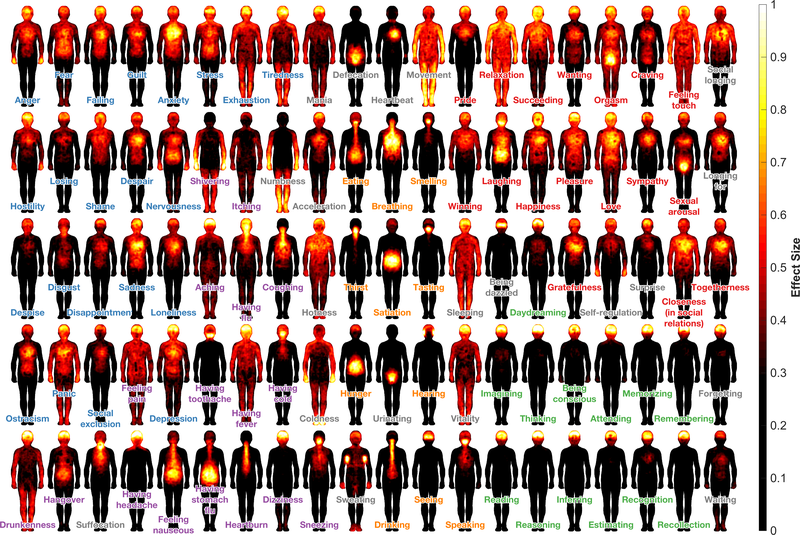 Figures: Map of subjective feelings and bodily maps of feelings.